Kardashian, Kim – After freaking out over losing a $75,000 earring in the ocean, KiKi takes a Hermes Birkin bag to the gym. Next, she’ll decide to wear Louboutins to a Tough Mudder competition. Mayer, John – The pop-rock wonderboy has released a clip of “Shadow Days,” a song from his soon-to-be-released Born and Raised album. This has shocked and dismayed millions of people who had successfully forgotten about him. Minaj, Nicki – The Grammy-nominated singer didn’t take home any awards, but her WTF faux exorcism sketch captured audience members’ hearts. No, seriously, if she keeps going down the Gaga trail, her next production will involve audience members’ actual hearts. Roses, Guns N’ – Matt Damon, Jared Leto, Jimmy Fallon, and others rocked out to GNR last Thursday at Hiro Ballroom in NYC. Rich, mainstream celebrities in their late 30s and early 40s “partying” in a ballroom to a band we thought was hard as f*ck in middle school? I’m officially old. Simpsons, The – The 500th episode of the groundbreaking animated comedy aired. No matter what we may think of the show’s past few years, at its best it was the best. Hats off to one of the funniest series ever made. This would make a great mug shot. 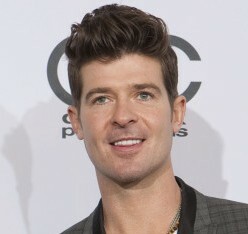 Thicke, Robin – Singer-songwriter Thicke was arrested recently for marijuana possession. He was not, however, cited for intentionally styling his hair like that, a far greater offense.